Jo Neary is a comedian, writer and actress perhaps most famous for portraying jumpy necrophiliac Judith in the BBC sitcom 'Ideal'. She's also a key player on the comedy club circuit, and is known for her one woman stage-shows such as Joanna Neary Is Not Feeling Herself. She won the 2004 Perrier Best Newcomer Award. You’re noted for basing your characters on real people whose idiosyncrasies you have followed closely. Did you take this approach when portraying Judith in Ideal? Yes! I did a character based on a girl in Brighton who looked at a mutual friends artwork and tried to be supportive but ended up suggesting (nicely) that they try something completely different. I thought this was funny, on top of which Alison had a curious way of speaking which I enjoyed mimicking. Then, when I got the audition for Judith, Graham Duff asked me to do it in that voice. I like to base characterisations on real people rather than broad stereotypes (‘mad woman’/shopworker/ditzy’ etc etc) as it’s more inspiring to me. Although after 6 series (I wasn’t in series 1), the character morphed a bit along the way. Because I’m not very professional and I’m especially rubbish at concentrating. Were you surprised to see ‘Ideal’ come to an end and did you think it still had mileage to continue? Are you missing being part of it? Well. It definitely still had mileage because Graham Duff was still thinking of story lines and what would happen next after Cartoon Head was shot. But we had a good innings with 7 series. I would have loved it to continue and I did really miss everyone from Ideal this January (that’s when we usually film) but we are keeping in touch with each other and who knows, there may still be a future for Ideal yet. Johnny used to joke that we should tour ‘Ideal On Ice’. Haha! Outside of ‘Ideal’, you’ve had roles in things like ‘The Mitchell and Webb Show’, ‘ Skins’ and ‘How Not To Live Your Life’ but never ‘Notting Hill’, despite what your Wikipedia page claims. However, I get the feeling that it’s the stage where you feel the most at home. Am I right in thinking this and if so why is this your preference? To be honest, they are so different and I’m incredibly lucky to have the opportunity to do both. I love live stuff because the reaction is immediate, you can be larger than life on stage, you can experiment with delivery and timing and hone your act, I love being in front of an audience except that time at Lancaster Uni. TV is ace because you can really concentrate on a bit at a time and getting it as right as you can, it’s a smaller more subtle performance and I especially love working with other people. On stage, I tend to do solo stuff you see. I have no idea who put that Wikipedia mistake up and as I am fairly computer illiterate, I haven’t looked into correcting it. You can if you like! I’ve obviously been mistaken for that other googly eyed ditzy girl with blond hair. You’re well known for your one-woman shows. Do you prefer working alone as opposed to with others? I’d rather work with others. But I am used to doing one person shows now and it’s nice once the audience are in. I hate waiting in the wings on my own though. I sit at the side for twenty minutes, drinking water and trying to remember how the show starts. Who were your comedy influences when growing up and have these changed over time? When I went to Falmouth Art School, I got into watching Victoria Wood on TV and her comedy soaked into my bones. My first ever show was basically a parody of her. Then I discovered Joyce Grenfell who, coincidentally, Wood had been inspired by. I listened to as much of her stuff as I could before having a go at monologues myself. My first monologue was about a woman who steals a child so it was pretty dark, not just comedy. It was based on the story of my childhood when I was stolen. Now that I work in comedy, I feel much more critical of comedy than when I was young. It’s a bit of curse, it’d be nice to switch off and laugh along. But to be honest, really great comedy like Johnny Vegas, Fawlty Towers, first series of Trailer Park Boys, Getting On, Laurel and Hardy, cuts through all that and just makes me laugh. 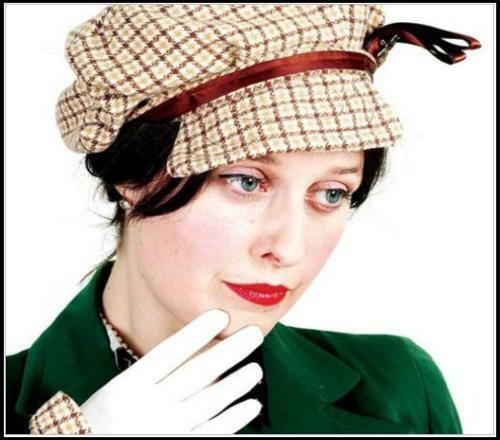 Could you tell us more about your character Lucinda Molesworth-Clarke and the inspiration for her? You’re referring to the photo of me dressed as a tramp that I put on to Facebook for a bit! I like to think that Lucinda was once quite wealthy and high standing but had a nervous breakdown and took to the streets (yes, based on a real person, this time in Brighton called Philip. A very sad tale). I got dressed up like that for Babycow and Komedia production of Gomarjobat. I was the love interest. I only put it onto Facebook because I was trying to sabotage Facebook taking over the world. But then all my friends started unfriending me so I took it down…. You seem to be planning a rather quiet 2012, with very little in the way of tour dates scheduled. Do you have any plans for the year and will you be at Edinburgh this year? Ahah! I’ve just had a baby so won’t be going to Edinburgh this year, maybe next. He looks nothing like Plastic Face. So I’m taking him with me to a few Festivals this summer, where I’m doing my comic turn and I’m also concentrating on writing, inbetween singing songs about mice and birds to him. What would you be doing if you weren’t in comedy? I like barwork. Meeting people, observing people. I always wanted to run a pub. I also qualified as a teacher the year before Ideal series 2 but trying to teach while doing gigs was a killer. So maybe a teacher, it’s a lot like stand up. Crowd control, acting, dealing with hecklers, not drinking too much before you go on. What is it about human behaviour that is so easy to derive humour from? Does the inspiration ever dry up or are constantly finding new material from the people around you? Personally, I seem to be drawn to people who are a bit deluded. I think it’s because I’m deluded and I recognise it in others. Of course sometimes I feel uninspired but I just have to go on a jaunt and people watch or have a rant about celebrities and politics and something comes out of it. The last time I deliberately set out to get inspired was when I paid to attend a ‘Colour Me Confident’ style course where you get taught what colours suit you. It was highly entertaining. Next up is baby yoga. Oh boy. Of all the characters you’ve played on stage and on screen which one is your favourite and why? I do a version of Judith on stage – she doesn’t have a name yet – which is great fun to do because it plays on people’s expectations and worries and has loads of jokes. I act really nervous and people often think it’s real. Once the jokes come along they realise I’m not but I love the fear in the room and sharing the joke with the audience. On screen – I really enjoyed doing a 1940s woman in a Mitchell and Webb Rebecca parody, partly because I liked what they did with my hair and I got to wear a big dress, which was made for me. Sometimes this life is more like being at Primary School than work. Heaven! But obviously, Judith is my favourite because she’s shy, secretly feisty, gullible, unfortunate and wears startling outfits. And I got to get my teeth into that role over the years. Stay tuned for more Lichfield Interrogates next month.